It was not one of those "Love at first sight" experiences. It was not one of those "Love at first sight" experiences. In fact, it started in the beginning of the '60:s when I was in Riccione, Italy. That's when I first saw an Alfa Romeo sporting car. It was a Giulietta Sprint and it looked so slim and fast. The thing that really turned me on was the roaming sound from the twin-cam engine. I can still remember when a red Giulietta Sprint came on the Viale Dante in 2nd gear with the 1300 engine revving, slowly passing the spectators. The engine was at constant revs, and the driver looked very pleased. The guy in the car was an Italian who, like most Italians, had a genuine passion for beautiful blond Scandinavian girls. Since I knew a lot of blond Scandinavian girls who were staying at the same hotel as I did, I asked him to take me for a ride in the car. This "Mini-Casanova" laughed and said "never, never", but if I could introduce him to the girls, we might have a deal. That said and done. I was fourteen years old and the girls were eighteen or more, so they all treated me like something the cat had taken on the carpet. Teenage girls never like younger boys, perhaps they remind them of their kid brothers? However, I soon found out that one of the females was kinda attracted to the Mini-Casanova, so I arranged a meeting. The blond, Lena, said she would only date the Italian if I was there too. Wow!!! That evening he came in his red Giulietta Sprint and Lena was very good looking. I had to sit in the back seat, but there was no back seat, only a little space to keep your tennis rackets. Never mind, I was in the Alfa. Then Mini-Casanova took off! This Giulietta Sprint only had two engine revs, idling and 6.800. I soon changed his name to "Mini-Fangio" like he was driving. He was shifting gears like mad and overtaking every car on the road. The engine was roaming like an airplane and he was using its full power. After some minutes we left Riccione and were heading for San Marino. The Giulietta Sprint was designed for the narrow roads leading up the mountain to San Marino. We met many other cars on the winding roads, but Mini-Fangio was the king of the road. The brakes were extremely effective and I was rumbling in the back seat as he stopped and accelerated. I'll never forget the roaming sound of the well-tuned Alfa-engine. When I was exited and screaming for more, Lena turned blue and green and pale. She didn't say a word; she was just sitting there with her big blue eyes wide open. Suddenly, everything she had eaten the last week came out on the dashboard. End of racing. I had to take the bus back with Lena who blamed me for everything. She thought she would be killed in that terrible car and swore, she would never enter an Alfa Romeo again. Well, I certainly would! As always, never trust a girl. Two days later she was in the Giulietta Sprint again, but this time I was banned from the car. Mini-Fangio was Mini-Casanova again! Well, to tell you the truth, my passion for the Roundtail is something like love affair. I have never had so many good times in my life as when the Roundtail is involved. 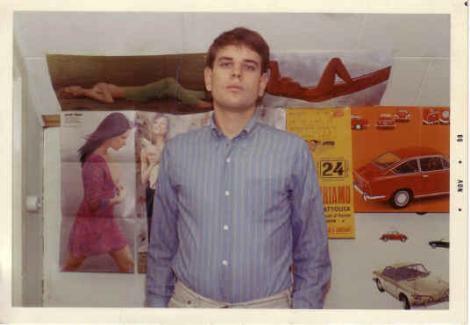 As you probably already know, in 1962 to 1970, I used to work in Riccione, Italy when I was a teenager. That sure was something, leaving chilly Scandinavia for the warmth of the sun in Italy. My task was to make some clubs popular and well known to young Scandinavian tourists. Imagine how fun that was. 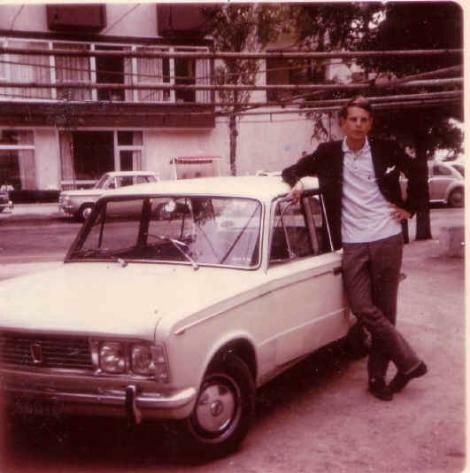 1966 I had a FIAT Spider, a car owned by the company, but was constantly looking for Alfas. You may share my joy, when Sandro, the brother of my "Patrone" Stefano Pattaconi came slowly in his red Duetto 1600, second gear and constant 3.000 revs. What a sound. I must have looked quite funny, the size of my eyes were like ordinary beer-glasses. I had never ever before seen something that turned me on to this extent. The shape of the rear end of the red Duetto was like the shape of a beautiful girl, very sensual. Today, I say it is like a beautiful woman, now that I am 50+. The taillights correspond so gently to the lines of the bumpers. The Round tail gives me a vision of a very attractive female giving me the eye. Wow, it really turns me on. Here are the articles in the newspapers. Today, I am not so proud of it. Sandro was not that keen on me driving his red Duetto, but we made an agreement. Since I was a tall blond Scandinavian with no red Duetto but lots of female connections and he was rather small, Italian and no such connections but a red Duetto, we got along. We both drove over to the clubs and when he seemed to like the atmosphere, he stayed and I drove away. I could drive for hours along the Adriatic Sea. Listening to the sound of the Webers and the twin cam engine, overtaking and shifting gears all the time. I often forgot to return until the sun was rising. It was hard to explain to Sandro, that I had only been driving and not fooling around with his girlfriends. The arguments always ended with something like "sorry, won't happen again, but I know a nice club with lots of blondes!" That solved the problems. I was so fascinated by the red Duetto that I slept only two to four hours a day. My eyes were beginning to look rather dark with some spots of red. Tired but very happy. His red Duetto had one of those (today) very primitive record players with just one single loudspeaker. I had two ears and three records. So what did I do? I played Jerry Lee Lewis "Roll over Beethoven", Neil Sedaka's Oh Carol, Rita Pavone's Cuore over and over again. The Italians were not that keen on this kind of music so I met new Italian friends all the time wherever I was driving. They preferred Rita Pavone or some of the very good Italian artist instead. The main problem in those days was money and gas. I made a fool of myself quite often, when the red gas warning light turned on. It might be nice sitting with a nice female out in the woods with no gas, good music (my kind of music, that is) and necking. My problem was, that the gas stop always happened right in the middle of Viale Dante with the crowd of tourists all around. No necking there, no, no. I had to borrow from my girlfriends to be able to get some fuel. Some females have a tendency not to value sitting in a red Duetto, talking gear ratios, twin carbs etc. Pretty soon I was known as that "Alfaholic with Spidermania". That summer, a Swedish newspaper was doing a report about vacation and Italy. Well, I was there and drove around with the red Duetto, showing the clubs and discoteches, rather rare in 1967. I introduced the journalist to some of my friends and he wrote like a maniac all the time, took pictures and asked funny questions. 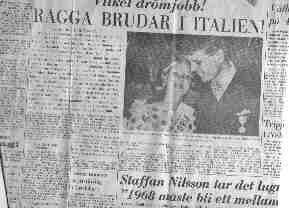 My mum had her 60'th anniversary in September, and that very same day, the newspaper had a very big article about me. I was appointed the guy who's only interest was to fool around with cars and girls. My mum and the rest of the family were very, very, upset and my current girlfriend who was in Sweden, became my ex-girlfriend. I found it very odd to explain on the phone from Italy that the article was not true. Nobody believed me. I still remember that night, all alone, no friends; girl had run away, mum embarrassed. What to do? No problem. I just took the key in my hand and looked at the red Duetto. I jumped in the car to just sit there for a while. I turned on the ignition and listened to the mumbling engine and the sound from the Webers. Gently pressed the clutch down and pressed the accelerator, up and down a few times to check the oil pressure. Engage first gear and take off, not too fast, just so the engine makes the rear tires get a firm grip of the road. Second gear. a bit more on the accelerator but no too much. I did not want the rear of the Roundtail to skid. Third gear and now it is time to use the full potential of the car, revving 6.500 it is time to cool down so I use fourth gear and the fifth gear and cruise along the Adriatic sea. The red Duetto is becoming quite close to me now, like she was putting her head on my shoulder. Time to turn on the record player, Jerry Lee "The Killer" rocks on. The red Duetto is almost flying and she takes me up in the blue sky, where "Io volare et cantare" out my happiness and joy. I was so motivated that I forgot time, newspapers, Sandro, Mum, eating, returning or Policia Stradale. That ride cost me around 150 USD. The Law had been trying to overtake me for five minutes they said. Anyway, that was when I decided to buy a red Duetto of my own. That was the car to have. In the '60:s sporting cars were not that common. Most people had a relation to a sporting car like people in the '90:s have to a Ferrari, just dream about it. In Sweden Alfas were very rare in 1960. The same company imported Rolls Royce, so the numbers were very small them. We had an excellent racing driver, Joakim Bonnier, who drove black Giulietta Sprints with good results. Bonnier was later driving in the Formula 1, but was unfortunately killed on the racing track. When the Giulia 105-range arrived with the Giulia 1600 Super, many people were fascinated by the design. Some people said that the rear of the car looked like the inside of a refrigerator, where the wall is welded to fit bottles and eggs. I found that part being the best design of the car.